September was a busy month here at the Bike Index - we recovered 34 bikes - 32 of which are detailed here. So, yes - this writeup's a little overdue - we were busy hustling to help get all these bikes back to their owners. Finally got the bike out of the PPB property room - thanks for all you guys for having this service! The bike was dumped a block and a half from where it was stolen, likely because it had no pedals on it. The residents of the house where it was dumped found the serial number here, and called me. An apartment manager noticed a dodgy resident using it so he looked up the serial, which brought up this site - Bike Index. He contacted me about it and I went around to pick it up. Thanks! An officer from SPD North Precinct saw the description on your site and just happened to spot my bike a short time later. Less than 12 hours after it was stolen. Yes, yes you helped!!!! I'm glad I registered my bicycle with Bike Index - the officer went straight there when he saw my "Death to Bike Thieves" sticker that I got after my Raleigh was stolen the first time. I covered it on Instagram! Please feel free to share my story! SFPD recovered it from some drug addicts who were preparing it for sale. Thanks, Bike Index for publicizing the theft! This gorgeous Rivendell was spotted for sale online (Ebay, natch) by a number of riders and online spotters who instantly recognized it from its Bike Index listing. The 'RBW Owners Bunch' group in particular were all over it - I received a half dozen emails from their members within about 15 minutes. The owner was able to engage police and get the bike recovered from the pawn shop that had listed it for sale. A random stranger found the bike abandoned in a park a few miles away from where it had been stolen. He was able to identify it as mine from the picture I posted on Bike Index. Thank you! Bike Index emailed me about a Craigslist ad matching my stolen bike and I set up a meet with the person. I met (the seller) and ... verified the serial number. I told him when and how I lost the bike, showed him the police report, and produced my ID. He took pictures of both ... and called the police - understandably, since he said he bought it off a pawn shop for $600. We spoke to an officer who said that since this is a friendly encounter and he wasn't there, he could not recommend just giving me the bike. 'Unless I could produce a receipt and then the best course of action is to do this at the police station.' I didn't have my receipt, but I bought it from Performance Bike in Lincoln Park, so I just called them and they verified that I bought this bike there and emailed me the screenshot of the record. The seller was satisfied and gave me my bike back. FOUND THANKS TO YOU GUYS!!! I got a call from someone who found it outside their place of business. It was a different location that I remember locking it. It had only the rear wheel lock locked... The chain lock was sitting in the panniers. It's possible someone tried to walk away with it then reconsidered. Recovered by Portland Police Bureau officers, details unknown. Another bike recovered by Portland Police Bureau officers. ... aaaand yet another bike recovered by Portland Police Bureau officers. A neighbor found it listed here and then emailed me. I have it! It was saved by a neighbor on NW northrup it was just on the ground unlocked - the thief must have gotten spooked. THANKS SO MUCH for having this site. Without it I am certain I would not have my bike back. Thanks again You do good things! -- Bike Index notes this bike was found with no photo or serial number, which is rare. Another Portland Police recovery, even without a serial number. Notice a trend here? "I have your bike and it's safe. I bought it off a guy in front of the Madrona Grocery Outlet for $150 ... Was hoping it was legit, but the price was too good to be true, so I have been searching the web to see if it was stolen. Checked the serial number and it's definitely your bike. Nice bike by the way." A King County Sheriff's Officer spotted 2 people walking with my bike in downtown Seattle! She recognized it from my recent listing on Bike Index.org so she confronted the couple and confiscated my bike from them. Reported by someone who noticed a homeless person with it, checked Bike Index & gave me a call. We reported to the police a bunch of stolen bikes & parts in the same area as my bike was recovered: just south of Goodwill on Dearborn. Recovered via social media, the fact that I had photos, the distinguishing salmon colored back break pads, and pure luck! I am so happy, and can't thank everyone enough. Such an amazing support system for those with stolen bikes! Sending good vibes to those still searching. Likley the most epic Bike Index recovery yet: On September 28th, after *nine months* of chasing this bike, this Kuota Kharma was recovered in a robbery bust by Portland Police. This was stolen back in February - taken in a home break-in. One of our spotters discovered it for sale (on Offerupnow.com) this summer, and the owner engaged Portland Police for months to track it down. PPB eventually raided the sellers home and two storage units, recovering over 300 stolen items and making an arrest. The amount of seized goods was so large, Portland Police posted the items to their Facebook page to aid in identification. This arrest was covered in several places, including BikePortland.org, Portland Police, KATU, and others. Another recovery by Portland Police Bureau. Someone spotted this very, ah, oddly configured cargobike stashed behind their apartment building and got in touch. Even though it wasn't listed in the Bike Index, I rode over on my lunch break and quickly ID'd it as a cargobike/blender combination build from Toms Cargo Bikes in Portland OR. BikePortland.org got in touch with the owner and found that someone had stolen it from a homeless youth outreach program run by 'Outside In' - a non-profit based in downtown Portland. That's pretty low - and needless to say, we had the person who found it slap a couple of locks on it until it was recovered. 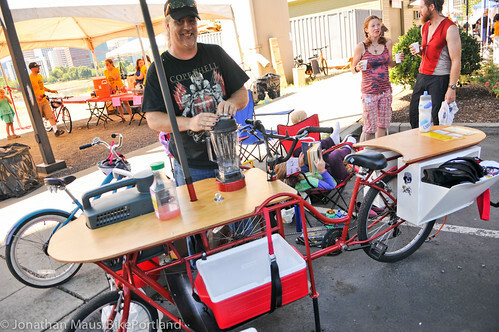 BikePortland covered this in "Community helps recover stolen cargo bike used in homeless youth outreach program". Another Portland Police Bureau recovery! "IT WAS OUR BIIIIIIIKKKKKEEEE!!!!! Officer Scott is DA BOMB DIGGITY!!!!" - Yes, this another Portland Police Bureau recovery!